Where in the world can you find Speleomantes strinatii? Speleomantes strinatii is native to northwest Italy and southeastern France (INCN Red List of Threatened Species 2009). There is evidence of exact locations of this species in the Maritime Alps in France as well as in Monte Pietravechia, W. Monte Groppi, Rio Tonno, San Bartolomeo, and Trabocchetto in Italy (Carranza et al. 2007). 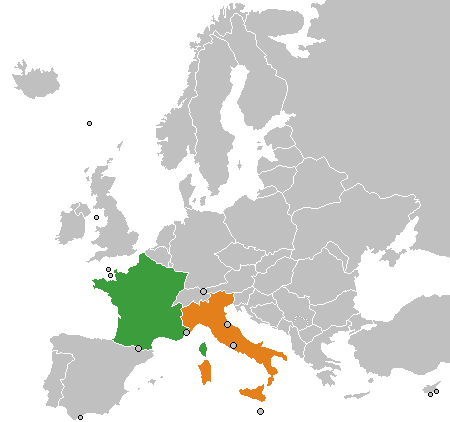 This photo, from Wikimedia Commons, highlights where France and Italy are located. 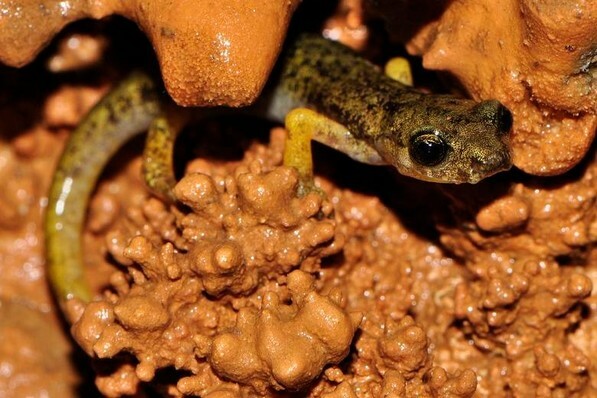 Where does close relatives of North-west Italian Cave Salamanders live? There are seven European Hydromantes that are closely related to the American Hydromantes which are found in California (Carranza et al. 2007). Two species that are located in California and related to the European Hydromantes are Hydromantes brunis and Hydromantes platycepalus (Carranza et al. 2007). European Hydromantes live in similar habitats as the Californian Hydromantes; therefore, the separation between the Hydromantes did not result in a huge variation (Carranza et al. 2007). European and American Hydromantes were separated approximately 13.5 Ma (Carranza et al. 2007). Before this evidence, it was believed that the separation of European and American Hydromantes occurred earlier (Carranza et al. 2007). It also is believed that the migration occurred across the Bering Land Bridge, which exists between Alaska and Siberia (Carranza et al. 2007). The genus of European cave salamanders is more recently known as Speleomantes; therefore, the terms, Hydromantes and Speleomantes, are interchangeable when describing the European salamanders (Salvidio 2007). If you would like to learn more about the classification of this organism, visit the Classification Page. As stated on the Classificaiton Page, there are seven different species in the genus, Speleomantes. They include Speleomantes strinatii, Speleomantes italicus, Speleomantes ambrosii, Speleomantes supramontis, Speleomantes sarrabosensis, Speleomantes imperialis, and Speleomantes flavus (Carranza et al. 2007). All of these species are located throughout France, the island of Sardinia, and Italy (Carranza et al. 2007). This is a photo of Speleomantes supramontis. Photographed by Gert Jan Verspui in July 2012 in Sardina. What type of habitat does this species live in? Due to the Messinian Salinity Crisis, the Mediterranean Sea decreased in size and the area surrounding the sea experienced a state of extreme dryness (Carranza et al. 2007). There is evidence that supports that the Messinian Salinity Crisis occurred between 5.96 and 5.33 millions of years ago (Duggen et al. 2003). In search of moisture, the species migrated to mountainous regions and caves (Carranza et al. 2007). You can visit other websites of cave dwelling organisms from MultipleOrganisms.net, such as the Spectral Bat. In addition to caves, this terrestrial species can be found in humid rock outcrops and leaf litter (Salvidio 2007). The photo above was photographed by Gert Jan Vespui in April 2012 in Liguria, Italy. This is a photograph of Speleomantes strinatii. What other organisms live in this type of habitat? In addition to European cave salamanders, there are other organisms that share the same habitat such as their predators. 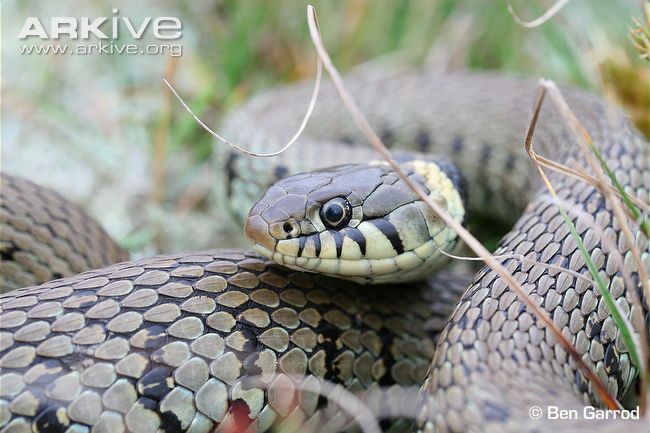 Most of their predators are different types of snakes including Natrix natrix, a grass snake (Lanza et al. 2005). 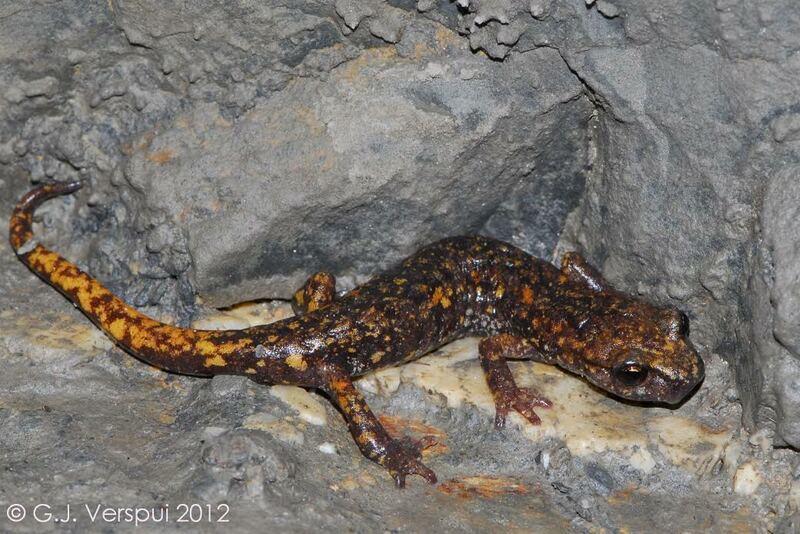 In addition to snakes, there is evidence that a gecko species called Tarentola mauritanica has been found in close proximity to North-west Italian Cave Salamanders, indicating that these species share a common habitat (Lanza et al. 2005). The photo above was photographed by Ben Garrod from Arkive.org. Do you now want to visit caves in Italy and France to find this slimy organism? Check out the next page to learn how this species moves!